Soulver is a beautiful notepad calculator app that you will love. It has a new interface that is far more useful than a traditional style calculator, which lets you do calculations over multiple lines, and use words alongside numbers, so that they make sense. Use it for quick calculations, calculations involving variables & percentages, unit conversions, and for thinking through problems that involve math. – Instant answers as you type. 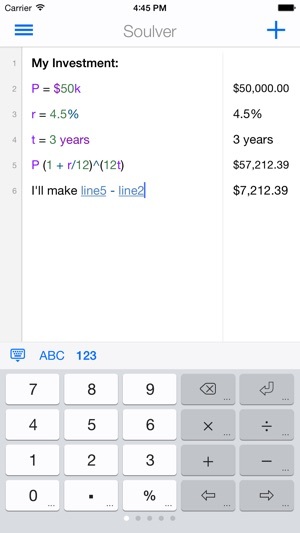 – Spread your calculations over multiple lines, and edit mistakes if you make them. – Reference previous answers by tapping on them. These are live references, like in a spreadsheet. – Easy percentage calculations using natural phrases like "15% off $350”, or "$250 + 12% tax", or "40 as a % of 390". 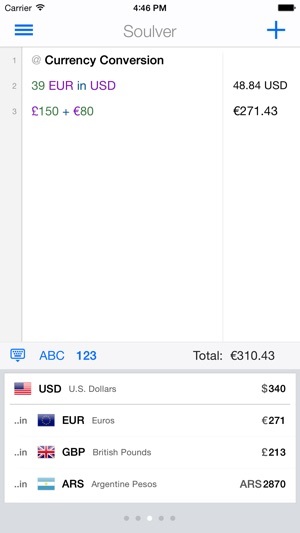 – Supports over 150 currencies (including Bitcoin), and has a specially designed currency keyboard for quick conversions. – Custom variables across all your documents, and a special keyboard for quick access to them. 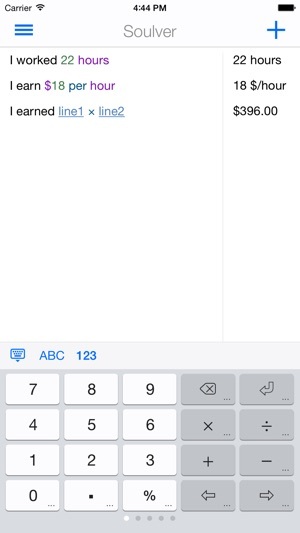 – All standard math and programming functions, also available on specially designed keyboards. – Save your calculations into documents. Soulver is also available for macOS. 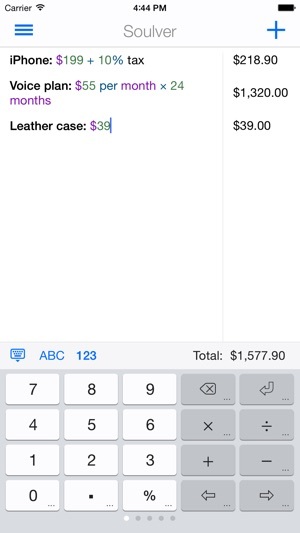 I love the concept of the app because I'm able to keep up with my weekly budgets and be able to label the amounts. But the app crashes every single time I use it. I get the error message that I can't use this title, then it tells me that this draft cannot be saved. One I get those messages I can hit save as many times as I want to and it won't do anything. I have to force close the app multiple times to get it to work, and then delete all the blank drafts it created when I was getting error messages, yet the app was still creating new drafts. It's extremely frustrating. I only put up with it because the app is so useful; if I found a good replacement I would definitely stop using this one. Love using it as worksheets! I use this to organize worksheets for different problems, including a monthly cash flow worksheet. Every month I copy the dozens of lines labeled for various income flows and paste it into a new sheet. Then I enter in numbers as I go. It saves all my worksheets and scenarios in iCloud. Love having access on both my phones and iPads. I’m not saying this is better than a spreadsheet but I don’t use spreadsheets on my phone and this is just my go to iPhone tool for working out scenarios and making sure numbers add up. Soulver is a great application, but I found one major issue - tapping on the Delete for a second, will bring up a popup to clear the whole line, or Clear All. If pushed by mistake, there is no way to undo!!! That's a serious flaw! Since it happened to me already a couple of times, and made me lose all calculations, that I had no backup to. This is especially frustrating, especially after constructing very long formulas. Everything is gone in a blink of an eye! Either adding support to the native shake device to undo, or add a popup window, asking the user, to confirm, they intended to completely clear all calculations! This issue been existing for the past few versions. Was hoping this would be discovered and fixed, but since it hasn't, I decided to let users and developers know of it. And that's the reason I gave it 3 stars only, at this point.